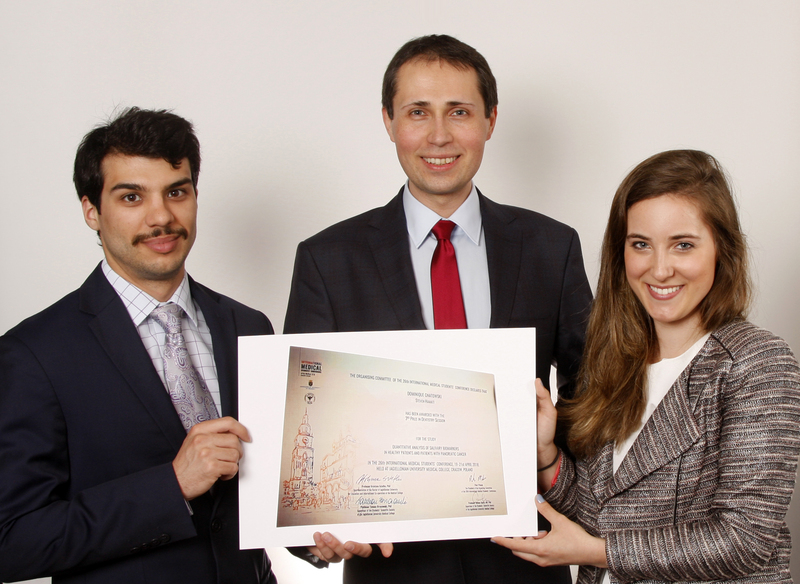 English Dentistry Division students Dominique Gnatowski and Steven Hamati placed third in the best student paper competition dentistry category of the 26th International Medical Students' Conference (IMSC) 2018 which took place on April 19-21 in Krakow. Our students were awarded 3rd prize for their work entitled “Quantitative Analysis of Salivary Biomarkers in Healthy Patients and Patients with Pancreatic Cancer.” Ms. Gnatowski and Mr. Hamati developed their paper as members of the student scientific society at the Department of the Periodontology and Oral Diseases. The research was conducted under the supervision of Dr. Andrzej Miskiewicz and Prof. Renata Górska, Head of the Department of the Periodontology and Oral Diseases. The 26th IMSC 2018 was organized by the Students’ Scientific Society of Jagiellonian University Medical College. Participants were able to attend conferences, workshops and paper sessions in over thirty different medical specialties, as well as in pharmacy, dietetics and health sciences. The Conference is a great opportunity for medical students from all over the world to present their research work in front of an international audience and make their first steps on their path to a scientific career.